Are you tired of French fries and looking for a different potato treat? Smashed fries are like a hybrid of French fries and home fries. If you like crispy, crunchy potato bits, smashed fries are for you. The first time I had smashed fries was at Bacon and Butter, where they have become a signature side for them. They are also a popular item on the Slightly Skewed truck where Rob adds Sriracha and a wasabi aioli. Smashed fries turn out to be quite simple to make and so I've chosen to make them with Tasteful Selections potatoes. Many know that my charity of choice in Sacramento is the Food Literacy Center, which educates low income elementary school children on proper nutrition and to eat their vegetables. Well Tasteful Selections supports a charity that is another one geared to children and vegetables. Katie's Krops was started by a 9-year old Katie Stagliano (she's now 16). The mission of Katie's Krops is to start and maintain vegetable gardens of all sizes and donate the harvest to help feed people in need, as well as to assist and inspire others to do the same. Once a year, Katie's Krops hosts an annual grant cycle where youths, ages 9 to 16, apply to receive funding to start a Katie's Krops vegetable garden in their community. From now through January, when you buy a specially marked package of Tasteful Selections potatoes, a portion of the profits will go to the non-profit to help maintain current Katie's Krops grantees and gardens and provide funding for a new grant cycle. Tasteful Selections potatoes can be found at Whole Foods, Nugget, Raley's, and Bel Air markets. When I was asked to do some recipes for Tasteful Selections potatoes, it seemed that smashed fries were the perfect thing to start off with. I chose Cajun seasoning, but you can chose your favorite, of course. Whether it's barbecue, lemon pepper, or Italian seasoning, smashed fries are the perfect way to have great flavored, crunchy fries. Heat a large pot of water to boiling. Add potatoes and cook until the potatoes are tender. Drain the water off. 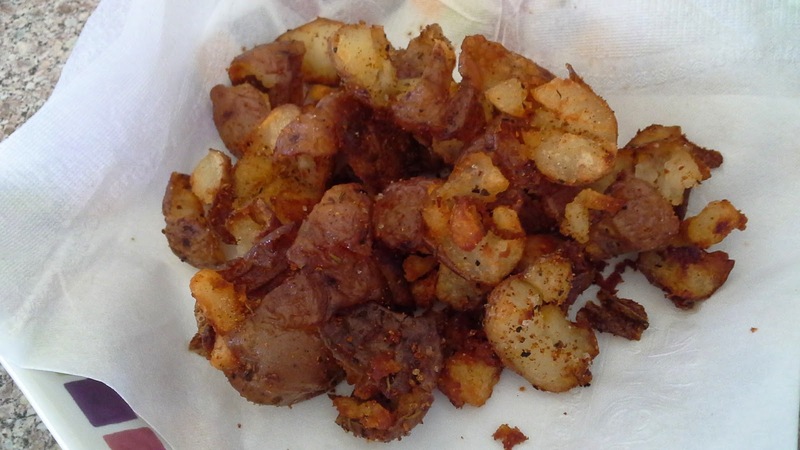 Prepare a plate by covering it with a couple of layers of paper towels to drain the potatoes once they are fried. In a large skillet add the vegetable oil until it is about 1/2 inch deep. Heat the oil on medium until sizzling. 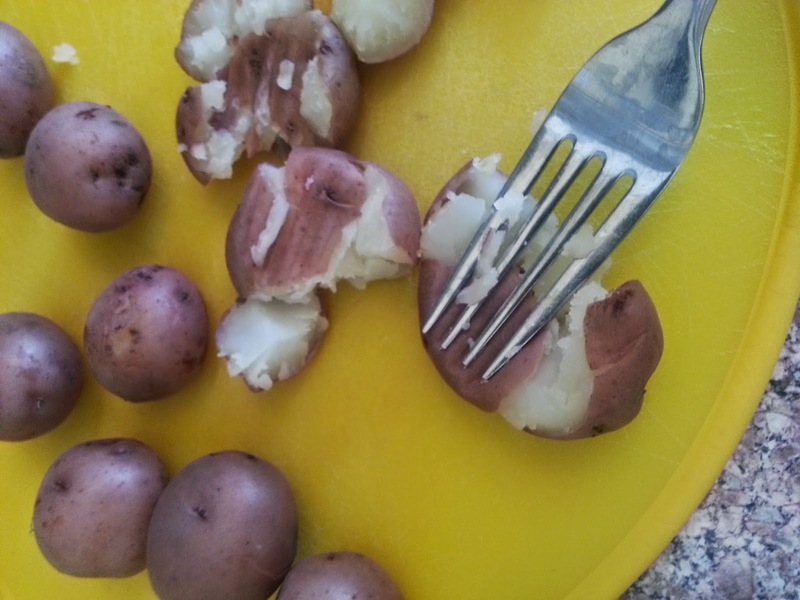 While it is heating up, take a large fork and gently mash each potato. Do not mash completely, but just enough to slightly flatten them and they still hold mostly together. Add some of the potatoes to the hot oil and let fry until crispy brown. Scoop out with a slotted spoon to the paper towel to drain. While still hot, sprinkle with Cajun spice and salt to taste. Repeat until all the fries are cooked and seasoned. Disclosure: Tasteful Selections sent me the potatoes and is paying for these recipe submissions.